Members of the various WILLIAMS families were found in and around Bitton, Oldland, Keynsham, Saltford and Kelston, from around 1700 and earlier, and also in the Kingswood and Bristol areas. 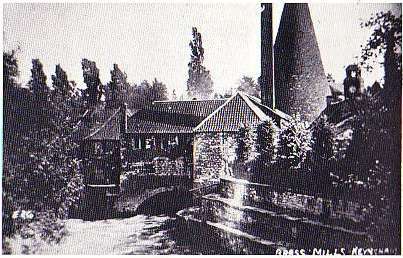 Members of some WILLIAMS families worked in the local brassworks for several generations. See the sidebar links for more information, and pictures of some these brassworkers. and Members of the Keynsham and Saltford Local History Society. Note: Clare is not activly researching. The following entry is as written in 2005. I am currently researching the family of our ancestor Joseph WILLIAMS, A "Roller in the Brass Works", who lived and worked around Bitton and Saltford between 1802 and 1842. I believe Joseph is related to the other WILLIAMS Brassworkers found in the local area. See the family of Robert WILLIAMS, a possible relative, on my WILLIAMS family of Saltford (Brassworkers) pages. I am collecting data on all local Williams families at this time and earlier. I am also interested in any information re the local Brass Industry and BrassWorkers. Baptised ? - born Bagley, SOM (census records). Married John BANWELL , later lived in St Philip & Jacob Parish, Bristol. Henry (1812 - later than 1881). Possibly baptised Saltford, 21 June 1812 ?, born Saltford (census records). Married Sarah (Unknown of Paulton SOM) at an unknown place, moved to London. Lived at No. 10, then No. 70 Gravel Lane, Southwark. Greengrocer, later Furniture Dealer. Wrote letters to his brother Fred in Australia. Baptised Saltford, 11 August 1816 aged 2yrs 1 mth. Our convict ancestor, transported to Australia in 1835 aged 21 (Iron Founder), with Joseph WILMOTT, (Coal Miner), his partner in crime. Married Margaret CONNOR/S in Sydney, 16 December 1844. Employed as Blacksmith, then Boilermaker, working with steam engines. Edward, Frederick, Joseph George, James Henry, Samuel Ambrose, John. Baptised Saltford, 21 June 1818. Married Thomas H NICHOLLS (25 Dec. 1840 Bristol), later emigrated to Australian goldfields. Baptised Saltford, 23 June 1822 - born Saltford (census records). Married John GRIFFITHS (19 May 1839 Bitton), later lived at Hanham. Charlotte (182? - later than 1876). Married "a good husband", later bedridden with a spinal complaint. Lived 15 miles from Henry.